Trelva (cornish: Turing Point, Place of Change) create atmospheric sounds, thrilling dancemusic and improvisations. 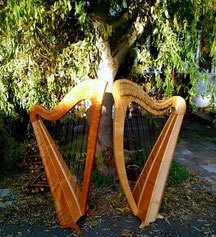 The celtic music is the base for new approaches and complex arrangements. Claudia Hoffmann and Babett Niclas play folk from Irland, Cornwall on fiddle and two harps. Cornwall is one of the celtic areas in the south of England. The music there has a very long tradition, but was not played often for a long time. In the last 30 years people started to rediscover the old beatiful tunes from over 300 years ago, which caused a revival of the traditional music. We can also find new compositions, for example the tune Trelva by Neil Davey. Claudia and Babett literally met because of their instrument the harp und share the passion for traditional music and interesting exciting improvisations.